“Polaris” was recorded in fall 2008 at Hästholmen and 5-by-5 studios, Helsinki, Finland. Mixed by the longtime confidant of the band Mikko Karmila the album became another shining polar star at the Northern sky. Powerful melodies mingle with sophisticated arrangements, strong anthems stand alongside heavy songs. 11 songs full of energy, musicianship, and a positive outlook. “Polaris” saw a worldwide release in late May 2009 on edel/ear music and JVC in Asia. 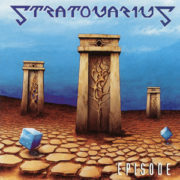 Being such a positive, powerful album it was acclaimed by both Stratovarius fans all over the world and the press. The band supported the release of Polaris with an extended world tour in 2009 and 2010. Currently Stratovarius are looking forward to join Helloween on their “7 sinners world tour” as very special guests, which happens to kick off in Vienna on the same day when the first single of “Elysium” will be released – November 26th. Stratovarius "My Eternal Dream" Official Music Video from the new album "ETERNAL"